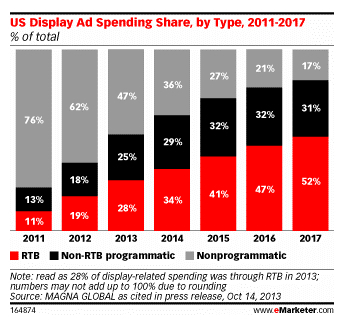 Why do we have programmatic buying? Isn't our existing ad infrastructure good enough? This article will show you why we have the programmatic system like we are having right now. Programmatic Advertising is the best form of advertising that cuts down on all the disadvantages created by traditional advertising. In this article, let’s find out why programmatic exists and make some bold predictions about its future. 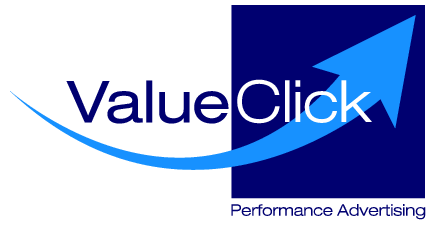 The firest banner ad that received a 44% click through rate was released in 1994 on the website Hotwired. By 1996, many more people had joined the web and the number of websites grew enormously. Brands, which initially negotiated ad deals with popular sites, found it increasingly difficult to keep track of their banners. Because of this problem, DoubleClick, among others, created ‘ad servers’ which helped to produce and distribute ads on the web. But as the web kept growing, it became difficult to manage the various relationships required to serve ads across different websites. So in 1998 the first ‘ad networks’ were born. The ad networks helped brands advertise on many websites through one ad dashboard. The media landscape became manageable once again. But by the late 90s, with the dot-com boom, the web was growing too fast for these networks to keep up. Web crawlers and portals, like Excite and Yahoo, emerged to index and categorize the web, but many felt at the time that the web had become too fragmented for effective advertising. By 2000, though, Google had developed a search engine which, almost miraculously, made the ever-expanding web accessible again. And then in 2000 Google, the great organizer, launched AdWords. AdWords was sharply different from the ad networks as it delivered ads against just about every site on the web – while the user was searching. It made effective advertising possible again. Google followed on by developing its own massive banner ad network (AdSense) in 2003, so with relatively simple interfaces brands were able to reach just about the whole web. Video advertising followed in 2006 with YouTube, and soon after Facebook started delivering ads against the social graph. Of course, a lot of details are skipped here but by 2007, it looked like things were pretty much under control. Every time the web became more complex, new technologies emerged to organize the media landscape and help advertisers reach their audience effectively. In 2007 Apple launched the iPhone and Google followed shortly after with the Android OS, and over the next four years, the whole game changed. 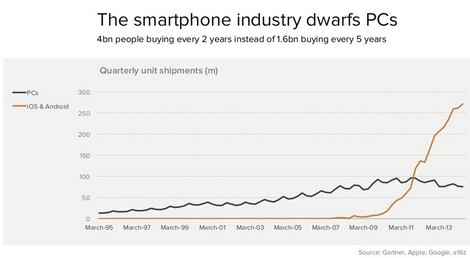 Over the four years or so after the launch of the smartphones, the price of internet-connected devices plummeted, ownership spread like wildfire and internet usage has skyrocketed. 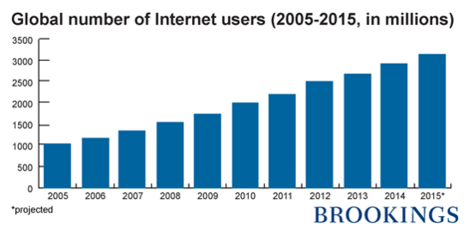 And between 2007 and 2011, the number of internet users doubled. And daily usage grew by 50%. And we are not done. 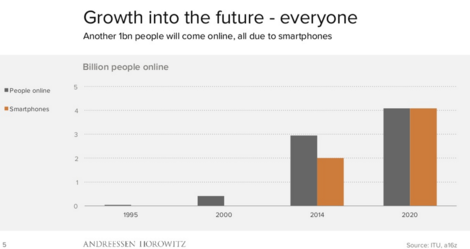 Internet users are set to double again this decade, from 2bn in 2010 to over 4bn in 2020. And usage, as we can see above is on an upward trend as well. 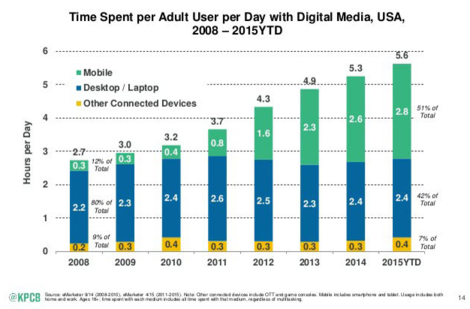 And this proliferation of devices and growth of time spent on the internet is not the whole story. We also consume our media differently now as well. With mobile devices, we now access the internet on-the-go and in random places and are subject to constant distractions. We consume media more in the ‘stream’ of social, messaging apps, or short videos, and less in a nicely-structured HTML page. All of this adds complexity and brings us back to an environment that’s incredibly difficult for brands to figure out, and means we are less effective at measuring advertising ROI. To see what is going to happen, and what we should do, we need to look back to the history of online advertising. From 1994 to 2007, the web grew and became much more complex just like now, and new technologies emerged to help advertisers navigate the new media landscapes. Ad servers helped serve banner ads more efficiently. Ad networks organized publishers. Google indexed the whole internet – and let us advertise on it. So how might this possibly happen again? How are brands going to reach consumers in such a fragmented media landscape this time? I believe the answer lies in the programmatic advertising buying infrastructure that is being developed right now. If you look at the diagram below, you can see the building blocks for the future of online advertising. The SSPs will hide the complexity from publishers and the DSPs will do the same for advertisers. In short, with such an infrastructure brands can concentrate on the message they wish to deliver and who they wish to reach, and technology will take care of the rest. Now some sites, notably Google and Facebook, have a different approach. They are attempting to organize the web once again and offer brand marketers simple, yet powerful, access to their network. But if mobile devices, usage, and behavior keep changing at the same rate, I think the distributed programmatic environment is a much more robust solution. It offers a high-level abstraction of the core components necessary to deliver advertising across a complex array of devices, interfaces, and publishers. Whether we have the actual products now is debateable, but the architecture that is evolving does makes sense and, by many accounts, it is set to take over display in the next few years. Well, if you feel like you’re late to the game, you’re probably not. 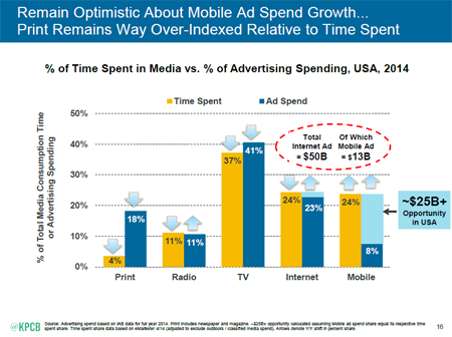 As Mary Meeker showed in her 2015 Internet Trends Report, mobile advertising is severely lagging behind other mediums if you consider time spent vs. dollars spent. And as most mobile advertisting will soon be programmatic, according to a recent eMarketer report, if you can capture that time spent on mobile with programmatic advertising you are probably still ahead of most others. If you’re wondering where to start, ironically the best place may be on Google and Facebook. I say this because even as they try to absorb the web into their own sites, they now offer ‘programmatic lite’ ad engines. And by becoming familiar with the vast features and analytics available on those platforms, you will be preparing yourself for more complicated programmatic ad buying in the future. Of course there are many other challenges for programmatic. It’s facing big issues from ad blocking, ad-free messaging apps, and privacy concerns. But keep in mind that the web has always seemed a difficult place for advertisers. New technology has organized the chaos before, though, and it seems likely that it will do it again.